The Intel® SSD Pro 7600p Series is designed for the M.2 form factor with the PCIe* Gen 3x4, NVMe* interface, and is ideal for corporate IT users. Designed for a range of devices from desktops to laptops, the Intel® SSD Pro 7600p Series will eﬀortlessly manage demanding client applications and easily handle intense multi-tasking. The SSD Pro 7600p Series will take PCs to a new level of ...responsiveness with fast application launches and file loading. The SSD Pro 7600p Series is part of the Intel® 3D NAND SSD family of products. Built on Intel® 3D NAND Technology, these SSDs transform the economics of storage. 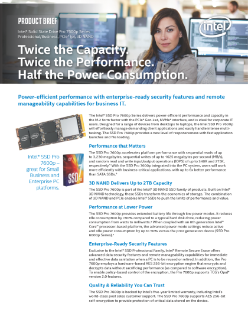 The combination of 3D NAND and PCIe* enables Intel® SSDs to push the limits of performance and value.